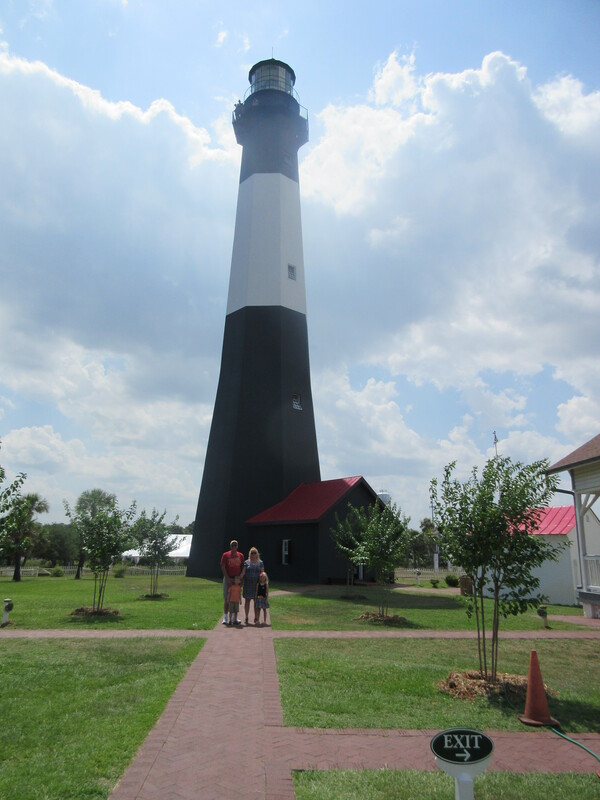 The Tybee Island lighthouse has seen a lot of history. Built in 1773, this was the third lighthouse built on this beach island off the coast of Georgia. Located just south of Savannah there is something quite romantic about this island and the fact that this piece of land has so much history. Different flags have flown here while the island was under the rule of Spanish, French, and amazingly enough pirates, as well as the Confederate government and then finally the United States of America. While visiting the island with my husband, son-in-law, daughter and grand children we pushed ourselves up the winding staircase to see the amazing view of the Atlantic. “You can make it,” I kept telling myself as I pushed my way to the top of the 145 foot lighthouse that requires climbing 154 steps! Did I mention it was mid-nineties and 100% humidity? I hope I sound as heroic as I felt. Quite an accomplishment for a woman of mature years I must say, but for one who likes an adventure, I pushed on! Once at the top we could see the Atlantic all the way to the mouth of the Savannah River. It is easy to see why this was used both for the protection of ships and as a coastal defense. The bottom 60 feet of the lighthouse is original with the top 85 feet constructed after the Civil War in 1867. In 1861, the lighthouse was burned by the Confederates. Before electricity was introduced as late as 1933 three lighthouse keepers were required to run this busy site. The keepers had to high tail it up and down the stairs carrying fuel in large pails. I bet there was not a chubby one among them! If Richard Simmons owned the lighthouse today he could make a small fortune playing 50’s music and racing dieting visitors up and down the steps. The site has three light house keepers cottages onsite. The head keeper’s cottage built in 1881 was open to tour. The porch was enclosed in 1907 and electricity was added in 1916. It was quite interesting to walk through the house and the gift shop which was converted three car garage, but the true highlight of the lighthouse visit is the amazing view from the top! 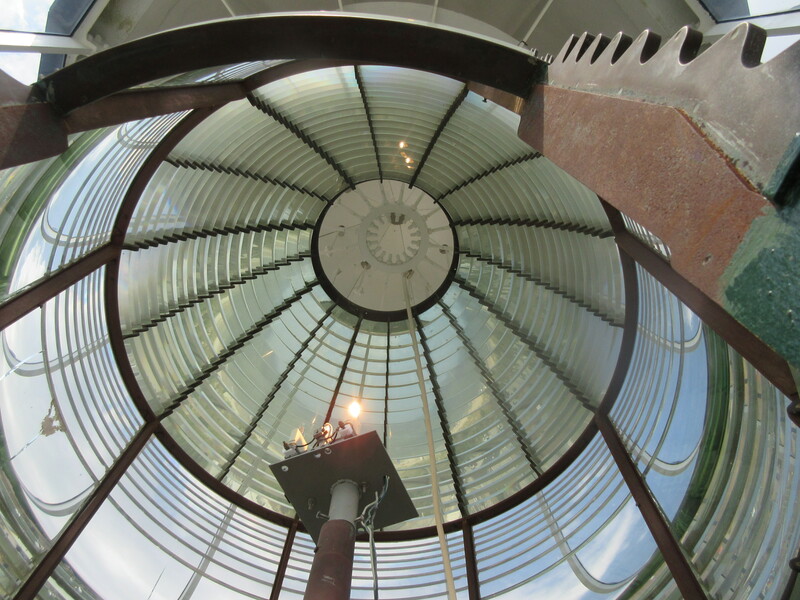 Looking up inside the lighthouse is also quite a treat viewing the 1st Order Fresnel lens that for years has aided navigators safely to shore. The lighthouse is still an active aid and the Coast Guard maintains the lamp and the lens. The Tybee Island Historical Society maintains the tower. Check out www.tybeelightouse.org for more information about this historical and beautiful site!